Sometimes you just can't get to your main supermarket, nor to the fresh veg stall on the market, so you have to make do with the corner shop and what is available there. It makes it more of a challenge, and more fun, to come up with a new soup recipe based on what you find and what you have got in your cupboards or fridge. Carrots and Broccoli seem to always be available, even in the smallest veg section, so the choice was more or less made for me. The challenge was to make the soup tasty! 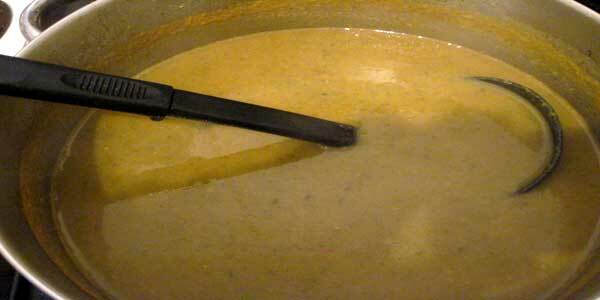 You can't beat good home-made soup and this is another easy one to make. When making this sort of soup quantities do not have to be exact and ingredients can be changed to suit your own personal taste. I have used all vegetable stock cubes to make it a vegetarian soup but you could replace them with chicken stock cubes or a mixture of both. The carrots I bought were wonderfully clean so all I had to do was remove the tops and then chop them up. 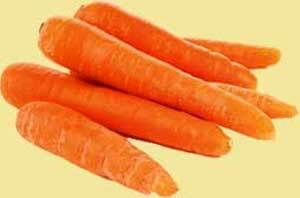 If you buy carrots in their natural condition you will of course need to wash them thoroughly and peel them if they are a bit rough. 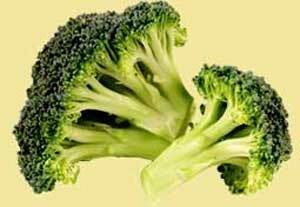 Only cook the Broccoli florets, discarding the big thick stem. Clean, peel and chop the carrots into roughly one inch pieces and place in pan. Break up your Broccoli and add florets to the pan. Remove the tops from the red chillies and then thinly slice them and add to the pan. Peel and roughly chop your garlic cloves. (You can use more or less according to your tastes.) Add to the pan. Add water to the pan so the level is about one inch from the top of your pan. Bring to the boil and then leave to simmer for an hour or so. Taste the soup to see how salty it is. At this stage you add three vegetable stock cubes ( I prefer Knorr stock cubes. I use the stock cubes both to enhance the flavour but also to season the soup as stock cubes are quite salty which is why you should add and then taste after they have dissolved.) Once dissolved taste again to see whether you want to add the fourth vegetable stock cube. Add the Smoked Paprika and the Chinese 5 Spice. Stir in well and simmer for a few more minutes before tasting again to see if you should add the teaspoon of salt or not. Finely chop your Parsely (plenty of it) and add to pan. Add a generous few twists of freshly ground black pepper. Continue to simmer for a further two or three minutes and then remove from the heat. Remove half the cooked carrots from the pan, drain them over a bowl so as not to lose any of your liquid and then discard. Liquidise the soup in either a liquidiser (will need to do in batches) or with a hand-held liquidiser so that a smooth consistency is achieved. Serve immediately or leave to cool and store in the fridge and reheat as required. If not using all at once only reheat the amount you need each time and not the whole pan of soup. Making anything like this does not require you to use precise amounts so do not worry too much about weighing or the size of the ingredients.